WARNING: Do not stop using this drug without first consulting your doctor. Your condition may become worse when the drug is suddenly stopped, especially if you have chest pain (angina) or heart disease (e.g., coronary artery disease, ischemic heart disease, high blood pressure). If your doctor decides you should no longer use this drug, you must gradually decrease your dose according to your doctor's instructions. When gradually stopping this medication, it is recommended that you temporarily limit physical activity to decrease strain on the heart. Seek immediate medical attention if you develop: worsening chest pain, tightness/pressure in the chest, chest pain spreading to the jaw/neck/arm, unusual sweating, trouble breathing, or fast/irregular heartbeat. USES: This product is used to treat high blood pressure (hypertension). Lowering high blood pressure helps prevent strokes, heart attacks, and kidney problems. This product contains 2 medications. 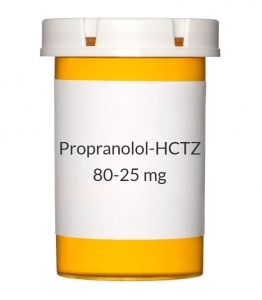 Propranolol is a beta blocker that works by blocking certain natural chemicals in your body (such as epinephrine) that affect the heart and blood vessels. This effect reduces heart rate, blood pressure, and strain on the heart. Hydrochlorothiazide is called a "water pill" (diuretic) and causes your body to get rid of extra salt and water. This effect may increase the amount of urine you make when you first start the medication. It also helps to relax the blood vessels so that blood can flow through the body more easily. These medications are used together when 1 drug is not controlling your blood pressure. Your doctor should direct you to start taking the individual medications first, and then switch you over to this combination product if this is the best dose combination for you. HOW TO USE: See also Warning section. Take this medication by mouth, usually twice daily or as directed by your doctor. You may take this medication with or without food, but it is important to choose one way and take this medication the same way with every dose. The dosage is based on your medical condition and response to treatment. If you take this drug too close to bedtime, you may need to wake up to urinate. Therefore, it is best to take this medication at least 4 hours before your bedtime. Consult your doctor or pharmacist if you have questions about your dosing schedule. If you also take certain drugs to lower your cholesterol (bile acid-binding resins such as cholestyramine or colestipol), take this product at least 4 hours before or at least 4 to 6 hours after these medications. Use this medication regularly to get the most benefit from it. To help you remember, take it at the same times each day. It is important to continue taking this medication even if you feel well. Most people with high blood pressure do not feel sick. It may take up to several weeks before you get the full benefit of this drug. Tell your doctor if your condition worsens (e.g., your routine blood pressure readings increase). SIDE EFFECTS: See also Warning and Precautions sections. Dizziness, lightheadedness, blurred vision, or tiredness may occur as your body adjusts to the medication. Nausea/vomiting, stomach pain, and unusual dreams may also occur. If any of these effects persist or worsen, tell your doctor or pharmacist promptly. Propranolol may reduce blood flow to your hands and feet, causing them to feel cold. Smoking may worsen this effect. Dress warmly and avoid tobacco use. Remember that your doctor has prescribed this medication because he or she has judged that the benefit to you is greater than the risk of side effects. Many people using this medication do not have serious side effects. The hydrochlorothiazide in this product may cause a loss of too much body water (dehydration) and salt/minerals. Tell your doctor immediately if you have any of these unlikely but serious symptoms of dehydration or mineral loss: very dry mouth, extreme thirst, muscle cramps, weakness, fast/irregular heartbeat, nausea/vomiting, severe dizziness, confusion, unusual decrease in the amount of urine, fainting, seizures. Tell your doctor immediately if any of these unlikely but serious side effects occur: shortness of breath, blue fingers/toes, swelling ankles/feet, mental/mood changes (e.g., depression), numbness/tingling of arms/legs, very slow heartbeat, decreased sexual ability, unexplained/sudden weight gain, increased thirst/urination, decrease in vision, eye pain. Tell your doctor immediately if any of these rare but very serious side effects occur: easy bruising/bleeding, signs of infection (e.g., fever, persistent sore throat), aching/swollen joints, yellowing eyes/skin, persistent nausea/vomiting, severe stomach/abdominal pain, dark urine, unusual change in the amount of urine (not including the normal increase in urine when you first start this drug). A very serious allergic reaction to this drug is rare. However, seek immediate medical attention if you notice any symptoms of a serious allergic reaction, including: rash, itching/swelling (especially of the face/tongue/throat), severe dizziness, trouble breathing. This is not a complete list of possible side effects. If you notice other effects not listed above, contact your doctor or pharmacist. In the US - Call your doctor for medical advice about side effects. You may report side effects to FDA at 1-800-FDA-1088. In Canada - Call your doctor for medical advice about side effects. You may report side effects to Health Canada at 1-866-234-2345. PRECAUTIONS: Before taking this medication, tell your doctor or pharmacist if you are allergic to propranolol or hydrochlorothiazide; or to other thiazides (e.g., chlorothiazide); or if you have had a serious reaction to other beta blockers (e.g., metoprolol, atenolol); or if you have any other allergies. This product may contain inactive ingredients, which can cause allergic reactions or other problems. Talk to your pharmacist for more details. This medication should not be used if you have certain medical conditions. Before using this medicine, consult your doctor or pharmacist if you have: certain types of heart rhythm problems (sinus bradycardia, second- or third-degree atrioventricular block), severe heart failure, asthma, an inability to make urine (anuria). Before using this medication, tell your doctor or pharmacist your medical history, especially of: other breathing problems (e.g., bronchitis, emphysema), diabetes, heart failure (treated, stable type), other heart problems (e.g., Wolff-Parkinson-White syndrome), overactive thyroid (hyperthyroidism), kidney disease, liver disease, blood circulation problems (e.g., Raynaud's disease), a certain type of tumor (pheochromocytoma), mental/mood disorders (e.g., depression), certain muscle/nerve disease (myasthenia gravis), high levels of fats in the blood (cholesterol/triglycerides), gout, loss of too much body water (dehydration), lupus, certain recent nerve surgery (sympathectomy), severe allergic reactions, untreated mineral imbalance (e.g., low potassium/magnesium, high calcium). Before having surgery, tell your doctor or dentist that you are taking this medication. This drug may make you dizzy or cause blurred vision. Do not drive, use machinery, or do any activity that requires alertness or clear vision until you are sure you can perform such activities safely. Limit alcoholic beverages. To reduce the risk of dizziness and lightheadedness, get up slowly when rising from a sitting or lying position. Significant loss of body water from too much sweating, vomiting, or diarrhea can also lower your blood pressure and worsen dizziness. Drink plenty of fluids to prevent these effects and dehydration. If you are on restricted fluid intake, consult your doctor for further instructions. Contact your doctor if you are unable to drink fluids or if you have persistent diarrhea/vomiting. This drug may reduce the potassium levels in your blood. Ask your doctor about increasing the amount of potassium in your diet (e.g., bananas, orange juice) or about using a salt substitute containing potassium. A potassium supplement may be prescribed by your doctor. If you have diabetes, this product may prevent the fast/pounding heartbeat you would usually feel when your blood sugar level falls too low (hypoglycemia). Other symptoms of a low blood sugar level, such as dizziness and sweating, are unaffected by this drug. This product also may make it harder to control your blood sugar levels. Check your blood sugar levels regularly as directed by your doctor. Tell your doctor immediately if you have symptoms of high blood sugar such as increased thirst, hunger, and urination. Your anti-diabetic medication or diet may need to be adjusted. This medication may make you more sensitive to the sun. Avoid prolonged sun exposure, tanning booths, and sunlamps. Use a sunscreen and wear protective clothing when outdoors. Older adults may be more sensitive to the effects of this product, especially dizziness. During pregnancy, this product should be used only when clearly needed. Infants exposed to the medications in this product during pregnancy may have low birth weight, low blood sugar, slow breathing/heartbeat, liver problems, or bleeding problems. Discuss the risks and benefits with your doctor. The medications in this product pass into breast milk. Consult your doctor before breast-feeding. DRUG INTERACTIONS: See also How to Use section. Your doctor or pharmacist may already be aware of any possible drug interactions and may be monitoring you for them. Do not start, stop, or change the dosage of any medicine before checking with your doctor or pharmacist first. This drug should not be used with the following medications because very serious interactions may occur: cisapride, dofetilide, thioridazine. If you are currently using any of these medications, tell your doctor or pharmacist before starting this product. Before using this medication, tell your doctor or pharmacist of all prescription and nonprescription/herbal products you may use, especially of: alpha blockers (e.g., prazosin), aluminum hydroxide, anticholinergics (e.g., atropine, scopolamine), calcium channel blockers (e.g., diltiazem, verapamil), chlorpromazine, diazepam, diazoxide, drugs affecting liver enzymes that remove propranolol from your body (such as cimetidine, St. John's wort, certain SSRI antidepressants including fluoxetine/paroxetine/fluvoxamine, protease inhibitors including ritonavir, rifamycins including rifabutin, certain anti-seizure medicines including carbamazepine), drugs that can increase dizziness (e.g., narcotic pain relievers such as morphine, barbiturates such as phenobarbital), other drugs to treat high blood pressure (e.g., clonidine, hydralazine, methyldopa, reserpine), drugs whose removal from the body is affected by the acid level in urine (e.g., amphetamine, methenamine), epinephrine, fingolimod, haloperidol, other heart medications (e.g., amiodarone, digoxin, disopyramide, propafenone, quinidine), lithium, MAO inhibitors (isocarboxazid, linezolid, methylene blue, moclobemide, phenelzine, procarbazine, rasagiline, selegiline, tranylcypromine), mefloquine, rizatriptan, theophylline, drugs for thyroid disease (e.g., methimazole, propylthiouracil, thyroid supplements including levothyroxine), tricyclic antidepressants (e.g., amitriptyline), warfarin. Check the labels on all your medicines (e.g., cough-and-cold products, diet aids, nonsteroidal anti-inflammatory drugs-NSAIDs for pain/fever reduction) because they may contain ingredients that could increase your blood pressure or cause a fast heartbeat (e.g., pseudoephedrine, phenylephrine, ibuprofen, naproxen). Ask your pharmacist about using those products safely. This medication may interfere with certain laboratory tests (including glaucoma screening test, cardiovascular stress testing using arbutamine, parathyroid test, protein-bound iodide test), possibly causing false test results. Make sure laboratory personnel and all your doctors know you use this drug. This document does not contain all possible interactions. Therefore, before using this product, tell your doctor or pharmacist of all the products you use. Keep a list of all your medications with you, and share the list with your doctor and pharmacist. OVERDOSE: If overdose is suspected, contact your local poison control center or emergency room immediately. US residents can call the US National Poison Hotline at 1-800-222-1222. Canada residents can call a provincial poison control center. Symptoms of overdose may include: very slow heartbeat, severe dizziness, fainting, trouble breathing. NOTES: Do not share this medication with others. Lifestyle changes such as stress reduction programs, exercise, and dietary changes may increase the effectiveness of this medicine. Talk to your doctor or pharmacist about lifestyle changes that might benefit you. Laboratory and/or medical tests (e.g., liver/kidney function tests, blood mineral levels such as potassium, complete blood counts) should be performed regularly to monitor your progress or check for side effects. Consult your doctor for more details. Have your blood pressure and heart rate checked regularly while taking this medication. Learn how to monitor your own blood pressure and heart rate at home, and share the readings with your doctor.